HOLLYWOOD, California — De’Aaron Fox was peeved about what truly was a respectable score. The ex-Kentucky star guard knew he could do better and didn’t appear to be going anywhere until he did. The heralded 2017 NBA draft prospect turned to the developers of his favorite game series, Need for Speed, with a nonnegotiable plea. “I finished in fourth place. Can you start the race over for me?” Fox said. Fox finished fourth with a time of 2:08 during his first attempt in a sneak peek of the new Need for Speed: Payback at EA Play 2017 at the Hollywood Palladium on June 11. Pleasantly surprised that Fox wanted another try, the Need for Speed producers quickly started the car race video game over. A determined Fox earned the day’s best time of 1:56:21 on his second attempt. Did the 2017 NBA draft live up to the hype? With all this NBA trade talk, why don’t the Celtics trade Brad Stevens? Need for Speed: Payback producer Jeremy Chubb told The Undefeated that Fox was “really good” and had the talent to play the game professionally. “He wasn’t going to let it go. He had to do it again,” Chubb said. “That was great to see. It did surprise me that he was that good. … All day we’ve seen people do about 2:08. He got around the same time his first run. He was like a seasoned [gaming] journalist playing a racing game. The other guy who had set the previous fastest time has been playing the game for 20 years. While Fox could be a pro with a video game controller, he will instead be focused on the National Basketball Association next season. Fox is expected to be a top-five pick in the NBA draft on Thursday in Brooklyn. The 6-foot-4, 171-pounder averaged 16.7 points, 4.6 assists, 4.0 rebounds and 1.5 steals during his lone season at Kentucky. While Fox was only with the Wildcats as a true freshman, another example of his competitive fire was his breaking down in tears after their Elite Eight loss in the 2017 NCAA tournament. One NBA general manager told The Undefeated that Fox was higher on his draft board than heralded UCLA point guard Lonzo Ball but behind Washington point guard Markelle Fultz. Fultz (expected to be selected first by the Philadelphia 76ers), Ball and Kansas swingman Josh Jackson have been receiving more pre-draft attention than Fox. But Fox believes he will eventually prove he is the draft’s best player. “I play the hardest. Offensively, I’m able to do everything. Defensively, I’m able to affect the game in that way as well. Not many players are able to affect the game on both ends of the court,” Fox told The Undefeated. Despite being a guard, Fox said his favorite player as a kid was fiery former NBA star power forward Kevin Garnett. Fox said his favorite current NBA player and the one he looks most forward to playing against is Oklahoma City Thunder All-Star guard Russell Westbrook. Westbrook is often considered the fieriest competitor in the NBA. Fox said he plans to bring a Garnett- and Westbrook-like intensity to the NBA next season. 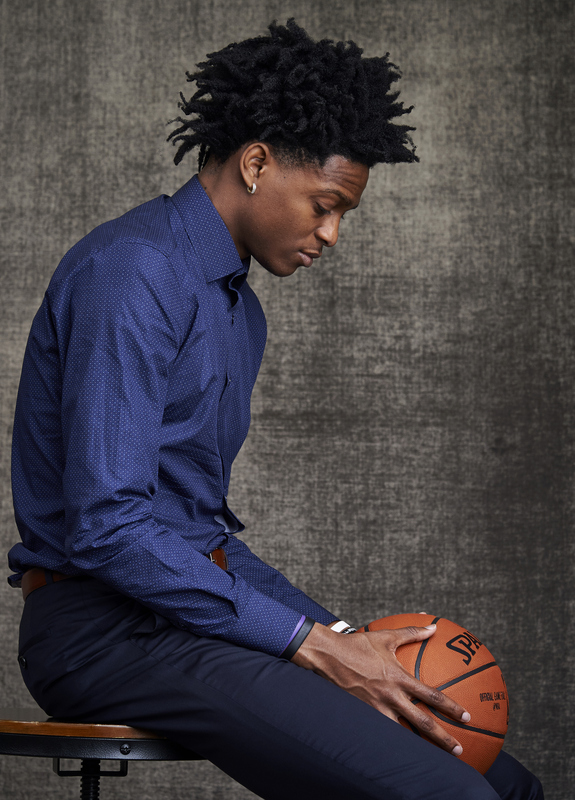 Draft prospect De’Aaron Fox poses for portraits prior to the 2017 NBA draft lottery at NBA headquarters in New York. “I hate losing, and that’s in everything: video games, basketball, anything,” Fox said. “I was always competitive from the time I was 10 years old to where I am now. I actually told some of the developers for Need for Speed that it’s actually the only game I broke a control over. My brother beat me in Need for Speed: Carbon when I was in middle school. And he started talking trash, so I threw the control at him. And I missed, it hit a metal railing and it broke. Fox’s last name and love for the Need for Speed series also seems fitting for one of the main attributes he is bringing to the NBA. A red fox can run 30 miles per hour. This Fox could compete as one of the fastest guards in the NBA, which could rival the speed of his mentor, Washington Wizards All-Star guard John Wall. According to Synergy Sports Technology, 31 percent of Fox’s possessions came in transition, 55 percent of his shots were around the basket and 5.9 points per game came on the fast break at Kentucky. Off the court, Fox’s future NBA employer doesn’t have to worry about him being a partier. If you wanted to find him after his high school and Kentucky games, he would be at home playing video games to relax. He is truly about that video game geek life. Fox prefers action games like Need for Speed and Battlefield over playing a basketball video game, although he did enjoy trying out NBA Live 18 and beating a journalist by 30 points. Fox has two video game consoles at home and a video game console he travels with. He is familiar with the esports stars and YouTubers and is working on a video game streaming channel to interact with fans. He also once rented a sports car in his hometown of Houston to simulate in real life a car he would use in Need for Speed. “It gets my mind off of basketball,” Fox said about video games. “I really stay away from basketball games. Like NBA Live is here, but I probably wouldn’t play it. I’d play Need for Speed most, FIFA, Battlefield, things like that. I just love playing games. I started playing when I was younger, and it kind of just came with me. Just how basketball has come with me, gaming has come with me. Fox’s basketball coach at Cypress Lakes High School, Emmanuel Olatunbosun, said when the “lights come on” Fox knows how to put on a show and mentally he picks up things very quickly on the floor. Gaston added that his client pushes himself hard in every drill without being prodded. The 2017 NBA draft is deep with point guards. But if you’re an NBA team with a need for speed, the competitive Fox could be your guy.